Here you can learn how to make quesadillas. 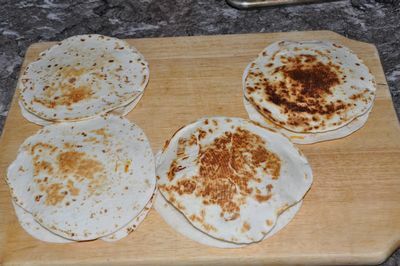 They are a great last minute meal and you there are a variety of different recipes and fillings for your quesadillas. To make a quesadilla, layer filling on top of one tortilla. Top with a second tortilla. In a skillet, add cooking spray and bake tortilla on both sides for several minutes until golden brown. Or bake in the oven for 6-10 minutes until crispy. Cut in triangles and serve. It is that easy! 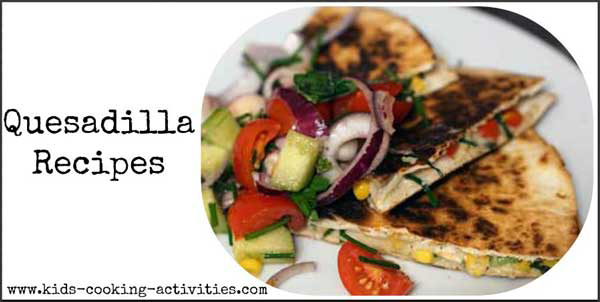 There are lots of different fillings you can create in a kids quesadilla recipe. Bean Quesadilla- Try refried beans and cheese. Beef Quesadilla- Mix in cooked ground beef to refried beans and a couple tablespoons of salsa. 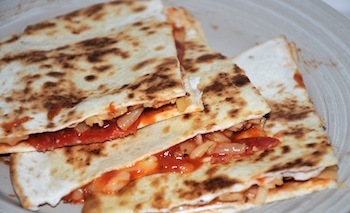 Pizza Quesadilla- pizza sauce, shredded cheese, pepperoni slices, whatever you like on your pizza go ahead and add it. See recipe below. Cheese Quesadilla- add whatever shredded cheese you'd like, cheddar cheese and Monterey cheese work well. 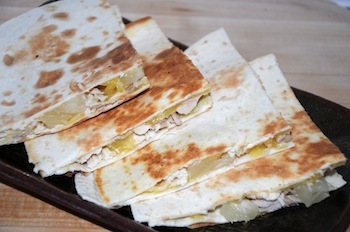 Easy Chicken Quesadilla- add shredded cook chicken, shredded cheese, sliced or chopped vegetables. Lay 4 tortillas into a non stick skillet and place over low heat. Spread 1/4 C of sauce evenly over each tortilla. Sprinkle each tortilla with cheese. Place a second tortilla over the top. Cook 5 minutes or until the bottom is lightly browned. Carefully flip the tortilla and cook an additional 3 minutes or until nicely browned. Remove and cut into triangles. Saute vegetables you like such as chopped peppers, zucchini, onions or eggplant. Add cooked beans to mixture. Layer mixture between tortillas. Bake or toast in skillet. Put ingredients (except tortillas) in a bowl and toss together. Brush cooking oil on one side of each tortilla. When grill is hot, lay one tortilla on grill, oiled side down. Spread filling mixture over the tortilla and cover with the other tortilla, oiled side up. Cook with grill cover closed, for about 3 to 4 minutes, or until cheese has started to melt, and you get nice grill marks, then flip and cook other side for another 3 to 4 minutes. Remove and serve with taco sauce, guacamole sauce, or other favorite dipping sauce. This makes 1 quesadilla  double, triple, or quadruple for more servings. Spread the chicken on to one half of each tortilla. Add the spinach and mushrooms over the chicken. Fold the tortillas over and press to close around the edges. Place the quesadillas into the warmed skillet. Cook 5 minutes or until lightly browned. Cook for 5 minutes longer or until nicely browned and the cheese has melted. Use wheat flour tortillas, any type of melty cheese and slice roasted tomatoes, zucchini, or green or red peppers and layer between cheese. Add salt to taste. Layer beans, hamburger, salsa and cheese on top of a tortilla. Top with second tortilla. Fry in skillet or toast in oven until golden brown. 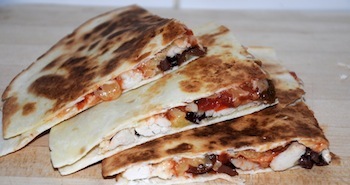 This is an easy chicken quesadilla that you can prepare for dinner when you are in a hurry. Layer cheese on top of a tortilla, add cooked chicken, slices of ham and sprinkle with more cheese. Add top tortilla and bake or toast. Our students made chicken quesadillas and loved them! Cook chicken in a fry pan. When half cooked, remove and dice into small pieces, return to pan and finish cooking. - Put aside and allow to cool heat a skillet on med- high heat place the buttered side of a tortilla down on skillet. On 1 half of tortilla layer Mexican cheese, chicken, tomato, mozzarella cheese. 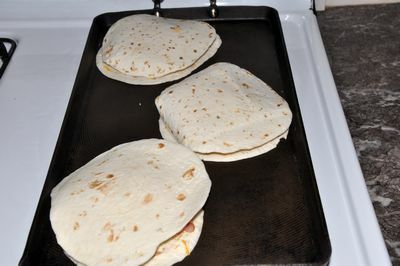 Using a spatula fold tortilla in half and allow side to brown for a few minutes. Flip and allow other side to brown. Allow to cool and dip in sour cream/salsa and enjoy! !